Over the weekend the weather was so hot that I barely went outdoors. Then late last evening the Hong Kong Observatory said the weather was unsettled and could lead to the possibility of a typhoon. This morning it was bright and sunny, but when I left my home to head to the bus stop, it started raining! After we got into the office, Typhoon signal No. 1 was already hoisted, and then less than an hour later it was up to Typhoon No. 3. By lunchtime people were speculating when it would be Typhoon No. 8 -- so that they could go home early. 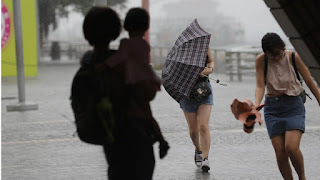 After 4pm the observatory issued an announcement that Typhoon 8 would be hoisted on or before 5.30pm -- Typhoon Merbok was approaching much faster than expected. And indeed T8 was issued at 5.20pm. By that time I was already on my way home, and there are pictures of the MTR packed with commuters. Merbok is expected to make landfall shortly in Mirs Bay in Tai Pang Wan, northeast of Sai Kung Peninsula.